Welcome to Oceanside Meadows Preserve, two hundred acres composed of a wide variety of habitats from rocky shore to sunny meadow, productive salt marsh to cool fragrant forest. Here we aim to preserve each habitat in its natural state while encouraging visitors to enjoy and discover the tremendous diversity of flora and fauna to be found. Utilizing our training; Sonja’s degree in geography and post-graduate degree in education, and Ben’s studies in marine biology and ecotoxicology, we are both dedicated to making environmental education and preservation the focus of our efforts at Oceanside Meadows. We hope to share the experience of our historic inn and extraordinary location with people that share our enthusiasm and wonder of our natural environment. We hope you will join us in our efforts to preserve our worlds natural and delicate balance; by visiting us here you will be supporting our goals of widening an understanding of the environment and appreciation of the great value that lies in the health of our worlds ecosystem. Oceanside Meadows is committed to programs that support these goals; furthering protection of lands on Schoodic Peninsula and the development of environmental education materials and resources such as this web site are a few of our ongoing projects. The evolution of all these programs are supported through the successes of the Oceanside Meadows Inn. We hope you come and join us here on the coast for what we will endeavor to provide – a unique and memorable experience. 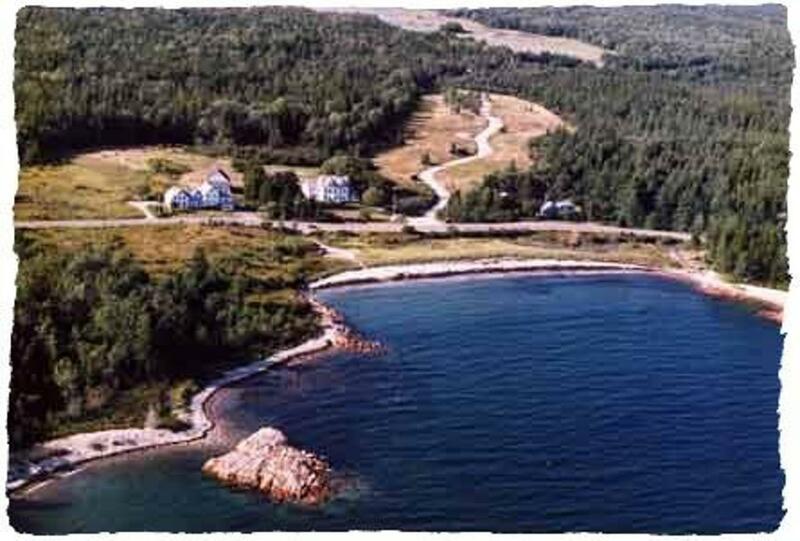 The property encompasses a wide variety of habitats, from deep ocean frontage, rocky shore and tidal pools that form the sides of the bay, a white sand beach and dune system that forms the head of the cove behind which there is a brackish water pond. Around the inn we have mature perennial gardens that are raised exclusively using organic methods. On either side of the inn there are two fresh water streams that flow throughout the year; the calming sounds of which blend with those of the crashing surf which can be heard all around the inn. Across the croquet lawn made up of mixed wild grasses the formal gardens end and the 100 plus acre forest begins. Stretching out towards the salt marsh this mature forest lies both on high dry ground as well as low lying wetland, traversed by many small streams, a combination that offers an extraordinary diverse collection of habitats. The salt marsh is the home to species that have adapted to a habitat in this ocean-land interface ruled by the rise and fall of the tide. A fresh water pond and stream sits at the head of the marsh and feeds in to it; a favorite feeding ground for many blue heron and moose, the home to many beaver and some otter. Looking closely at the above photograph the streams path can be clearly seen as it meanders its way through the marsh cutting a deep channel in the mud bed. Navigating this passage in sea kayaks on a high tide right to the head of the marsh is one of the best ways to view the hive of wildlife activity in this one of the world’s most productive ecosystems. The salt marsh is a bird watchers paradise that has been studied by a research group from the Smithsonian Institution over the past 20 years. Studies of bird species found at the marsh commissioned by the Maine’s Fish and Wildlife service document 94 different species sighted, including bald eagles, numerous hawks, ravens, loons, owls amongst many other rare and endangered species. Walking back towards the inn to the south east of the marsh, one passes through a five acre natural meadow that is home to thousands of flower and plant species, a favorite place for many butterflies, humming birds, and field mice. Hawks and eagles that are often seen flying over head looking for small voles and other prey who rely on the meadow for food. We have two interpretive walking trails: The Salamander Trail and The Heron Trail. Each trail is designed to allow guests to immerse themselves in the environment without damaging them. Through an ongoing program of environmental education, we hope visitors will gain a wider appreciation of the need to preserve the world’s delicate ecosystems. The guides keep the spirit of the originals designed to help our guests learn about the environment they enter when they arrive at our door. By presenting educational information about the habitats and species in an attractive, colorful format, we hope to promote an understanding of the living, breathing environment found here and everywhere. Guides are available for all experience and age levels, with introductory guides to help familiarize you with the area, intermediate guides to show you the different habitats, and advanced guides that go into depth regarding specific classes of organisms. We welcome you to familiarize yourself with the various habitats found on our preserve. We hope you will realize that learning about the various nuances of life is not only fulfilling, but fun! Please visit this new site again where we hope to show you more of Oceanside Meadows and our local area.